Herää kevyesti äänet vanha merenrantakaupunki. Hengitä syvään: tuoksu Välimeren yrttejä. Viileässä varjossa, sirkat, lokkeja. Pysy sängyssä? Ja ikävä Dalmatian katuteatteria? Kävelemme promenade, kivitaloja, selkeä taivas, barokkikirkko kellotorni. Kalastajat kiistelleet kuka teki näyttäviä saalis. Romance joka käänteessä. Jos näet itsesi tässä, jatka lukemista. Villa Dolce Vita omistaa paikallinen perhe, jonka esi-isät ovat asuneet täällä monien sukupolvien ajan. Jokainen kivi ja jokainen ruohonkortta ovat todistaneet tuhat vuotta rakkautta ja yhdessäoloa. Käynti sadun kaupungin Sutivan tarkoittaa koskettavaa ikuisuus, jatkuva perinne, luoda muistoja, virkistävä sekä kehon ja hengen. Hauskaa perheen ja ystävien kaksikerroksinen huvila uima-allas keskellä Sutivan. Kaksi king-size-vuodetta ja kaksi kahden hengen makuuhuonetta, joissa voi majoittua yhteensä 8 henkilöä. Peräti neljä pihapii- tarjoavat runsaasti ulkona yksityisyyttä. Kaikki on tehty kuuluisan paikallisesti tuotettua Brač kivi - seinät, portaat, lattiat, valtava ruokapöydässä puutarhassa ... Myös kolme kylpyhuonetta, sauna, autotalli, ulkona kuntosali, grilli, rusketuksen kannella vieressä valtava uima-allas. Pidä silmäsi pöytätennissä katsomassa purjeveneitä, Splitin kaukaisia ​​vuoria. Kaikki kylpyhuoneet ovat kauniisti sisustettu marmorilla ja lattialämmitys. Wow - this house has everything - great pool, wonderful outdoor spaces, fluffy towels, comfy beds, excellently equipped kitchen, a sauna and outdoor gym and two bikes! Ideal for two families or a family and grandparents (because they could have their own space in the very spacious self contained apartment on the ground floor) - and Sutivan itself is beautiful. We feel very lucky to have stayed here. Just book it if you can - you won't regret it. A beautiful villa in a great location. Well equipped and luxurious. One of the best we have stayed in.Lina was extremely helpful and the pre arranged transfer and ferry worked superbly. The views from the front balcony are stunning. Sutivan is a lovely quiet harbour town and the villa is a 3 minute walk to the centre so no car needed. We spent a week mid October at Dolce Vita and it was wonderful! We were a family of 6 plus the grandparents and the house was perfect for our group. There are so many little corners to escape to and to please everybody. We were concerned that it would be chilly this time of year but we didn't even need the heat even though it was provided. The hostess was a great help and willing source of information about the island, places to go etc. Brac (missing the correct symbol on this keyboard) is a perfect island to explore if you want to see a variety of things, inland and on the coast. Distances are minimal so no long car rides for kids who are only interested in gelato anyway, right?! Plenty of that to be found as well as great food and well stocked grocery stores. Brac is so clean and pleasant, friendly and small enough to feel very cosy. The white stone houses and terra cotta roofs are so beautiful. The Dolce Vita house is no exception and has been recently renovated with a careful eye to attention and detail. The view onto the sea from the morning terrace is so relaxing and spectacular. The pool was chilly but the kids swam any way and there is always a sunny or shady spot depending on your preference. It is definitely the end of the season mid October but that only means that it is quiet and the big crowds have thinned which makes it perfect! We were met at the villa and shown around on arrival. All the gadgets were explained, including air conditioning. Fab pool, BBQ outside space. Great views from the balcony Towels changed every couple of days. Ideal location, 2 minute walk to village centre, beach and harbour. Sutivan has a very relaxed uncommercial feel about it. Lina arranged for a taxi to take us back to the ferry in Supitar. Thank you for nice words, hope to see you again! We are not long back from an amazing stay at Dolce Vita. This house and location are truly a piece of heaven. Natalija and her daughter Lena were the perfect hosts answering any queries we had before our stay and also when we arrived. 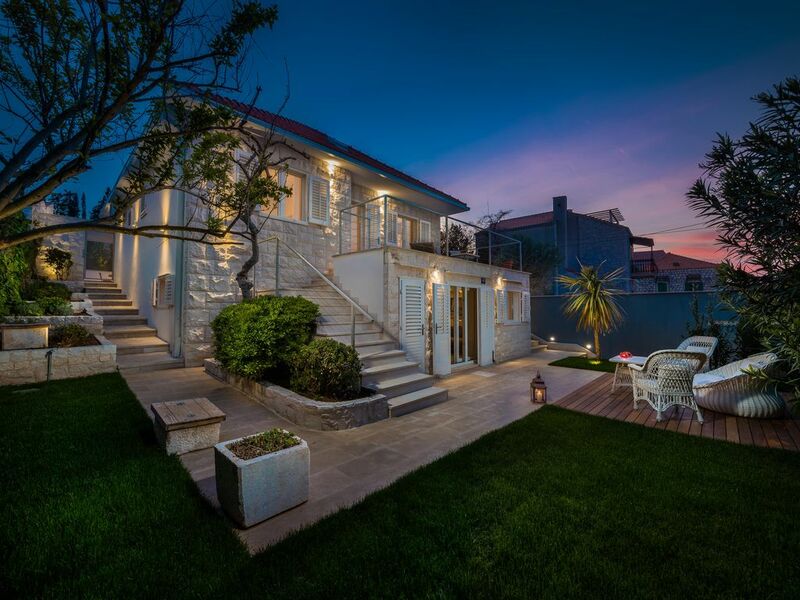 There were 7 in our family party including 3 teenagers and a Granny and we found the perfect place in this villa for very special family time :-) The house is absolutely beautiful, fitted out to the highest spec with cool chic design. There were lots of little peaceful places to sit and chill if it all got too much for anyone. Sutivan is a lovely place and the villa is a really short walk to the harbour. Supermarkets, restaurants and cafes all to hand. We ate out a few nights but cooked in the villa the rest of the time as the outside eating area lent itself to such a lovely family space. The pool was perfect and also the self contained apartment downstairs allowed for teenagers to hang out and watch TV.